Born on the outskirts of Kansas City, Harry S. Truman would grow up to become a farmer, soldier, businessman, senator, and ultimately the 33rd president of the United States. His terms as president were action-packed and historic. Sworn in just 82 days into his first term as vice president and following the death of President Franklin Delano Roosevelt, Truman faced the monumental task of ending World War II. Within four months, he declared Germany's surrender and ordered atomic bombs be dropped on Hiroshima and Nagasaki, effectively putting an end to the war. Later, he would propose initiatives to provide universal health care, a higher minimum wage, integrate the U.S. military, and ban racial discrimination in federal hiring practices. But it was his decision to enter the United States into the Korean War that led to a decline of his approval ratings and eventual retirement. Decisions made throughout Truman’s presidency had a lasting impact on the United States, and many of the issues and fears faced during his time — racism, poverty, and international tensions — are still relevant today. The only president in modern history without a college degree, Truman never let go of his modest Midwestern roots and eventually returned to his hometown of Independence, Missouri where his library and museum now stand just a short distance from his former home. 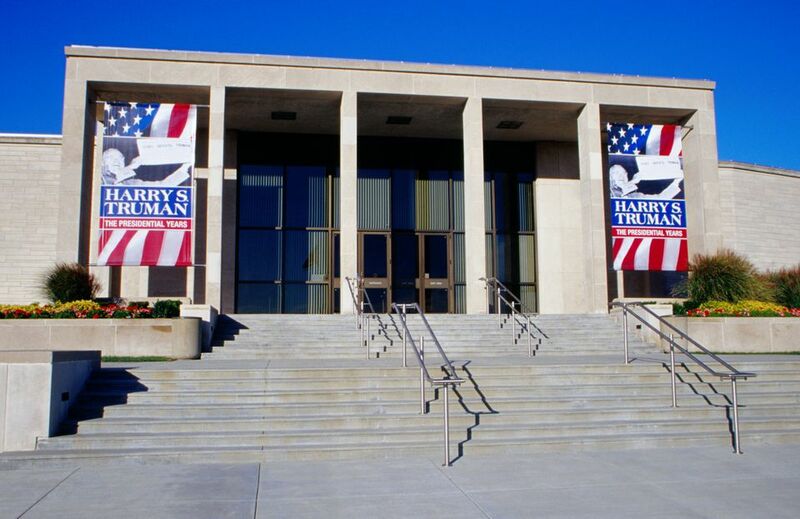 One of Kansas City's top attractions, the Harry S. Truman Library and Museum was the first of the 14 current presidential libraries to be established under the 1955 Presidential Libraries Act. It houses some 15 million pages of manuscripts and White House files; thousands of hours of video and audio recordings; and more than 128,000 photos chronicling the life, early careers, and presidency of President Truman. While the library has roughly 32,000 individual objects in its collection, only a fraction of them are on display at any given time. The library isn't only a museum chronicling a president, it's also a living archive, where students, scholars, journalists, and others come to research the life and career of President Truman. The files and materials are considered official public record, and the site is overseen by the National Archives and Records Administration. The library is located in the suburb of Independence, Missouri, a short drive from downtown Kansas City. While perhaps best known as the start of the Oregon Trail, Independence is where Truman grew up, started his family, and lived the last few years of his life. By building the library in his hometown, visitors are better able to gain a sense of the place that shaped his life and character. The museum is divided into two primary exhibits—one on the life and times of Truman, and the other on his presidency. The "Harry S. Truman: His Life and Times" exhibit tells the story of Truman's formative years, early careers, and his family. Here you'll find love letters between him and his wife, Bess, as well as information on how he spent his retirement actively engaged at the library. Interactive components allow younger visitors, in particular, to experience what life was like for the former president — including trying on a pair of his shoes. The “Harry S. Truman: The Presidential Years" exhibit is a bit meatier, with American and world history intertwined with that of the president's. Upon entering the exhibit, you'll view a 15-minute introductory film summarizing Truman's life prior to becoming president. Ending with the death of FDR, the video preps visitors for exhibit materials describing Truman's presidency and beyond. From there, materials are organized chronologically. As you meander through room after room, you'll see newspaper cuttings, photos, and videos depicting major events, and audio recordings of oral histories and historic speeches play on a loop. Staged period sets show the sharp differences in how the United States and Europe experienced life post-WWII, and flipbooks reveal diary entries, letters, and speeches written by Truman himself. Besides laying out the history of the time, artifacts on display provide insight into some of the tough calls made during Truman's tenure. Visitors grapple with these same decisions in "decision theaters," where they’ll view dramatic productions setting up a choice made by Truman and vote on what they would have done in his position. The library and museum hold a wealth of information and history regarding the Truman administration and life of the former president, but there are a few things, in particular, you should watch out for. This mural, painted by local artist Thomas Hart Benton in the main lobby of the library, tells the story of the founding of Independence, Missouri. As legend would have it, Truman himself dabbed some blue paint on the mural's sky after his frequent critiques led Benton to invite him onto the scaffolding, and the former president, never one to back down from a challenge, obliged. While no known record exists showing written authorization of the dropping of the atomic bomb, a handwritten note addressed to the Secretary of War at the time, Henry Stimson, dictates the release of a public statement on the bombing. The note, housed in a room titled "Decision to Drop the Bomb," is the closest thing to a final authorization for its deployment. Near the end of the Presidential Years exhibit in a room called "Leaving Office," you'll find a telegram Truman sent to his successor, President Dwight Eisenhower, congratulating him on his electoral victory and securing his place as the nation's 34th president. Look for the original “The Buck Stops Here” sign in the recreation of the Oval Office. The iconic sign famously sat on Truman's desk during his administration, as a reminder that the president is ultimately responsible for critical decisions made while in office. The phrase would go on to become a common expression, used by many politicians in the decades since. The former president spent his final years deeply involved with his library, even going so far as to answer the phone himself on occasion to give directions or answer questions. It was his wish to be buried there, and his grave can be found in the courtyard, alongside his beloved wife and family. The library and museum are open during business hours Monday through Saturday and in the afternoons on Sunday. They are closed Thanksgiving, Christmas, and New Year's Day. Admission to the museum is free for kids under age 6. Older kids and adults much purchase a ticket, with prices ranging from $3 for youth 6-15 to $8 for adults. Discounts are available for those over 65, and veterans and military personnel get free admission from May 8 to August 15. If you can't make the trip in person, you can explore many of the library's offerings on its website. Take a virtual tour of the Oval Office as it was during the Truman Administration, read through the permanent exhibits' timelines, and even few maps and documents — all from the comfort of your own home.